Discussion in 'Videocards - AMD Radeon' started by tede, Aug 6, 2017. 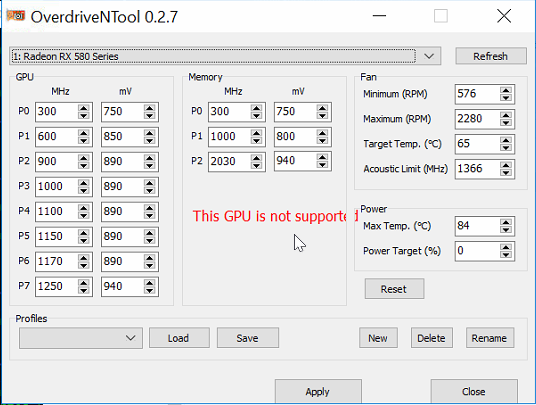 Just a FYI for anyone using 0.2.8 beta 1 (and latest drivers), I was able to get Zero RPM working correctly on my Vega 56 by setting P0 to "off" (0 degrees and 0 RPM). When the temperature hits P1 the fan will turn on as it used to with the older drivers.The only change made in Global Wattman settings was setting it to Custom profile as per usual. I did not make any further changes in there. asp, Dekaohtoura, MerolaC and 1 other person like this. Nice, this works great even on my Air Boost edition from MSI. Which doesn't have Zero fan, just like reference. Let's hope all the components used can tolerate the fan being off. The RPM is misrepresented when at 0%. I can see the fan not spinning. Not sure if you're aware, but just wanted to report a cosmetic issue. When I accidently switch to onboard graphics, the tool displays the following error below. This doesn't affect performance, it's just mildly distracting. Thx for the report. Does it happen everytime when you start the program and switch between GPUs? I am assuming this is what you used to set the fan states, judging by your previous posts? I am trying to get the methods on how to do so for a script I am writing, it landed me here. Would there be a possibility of posting maybe a small article on how the methods work for fan settings, at least how you guessed them to work? Contact me on PM, I will write you how I use these 2 functions. It's just my guess but it seems to work right. I still don't have newest ADL SDK and it seems that AMD has stopped providing last updates to ADL SDK on public. Despite of the date that states 17.01.2019 this is version 10.2 from 2016 year. 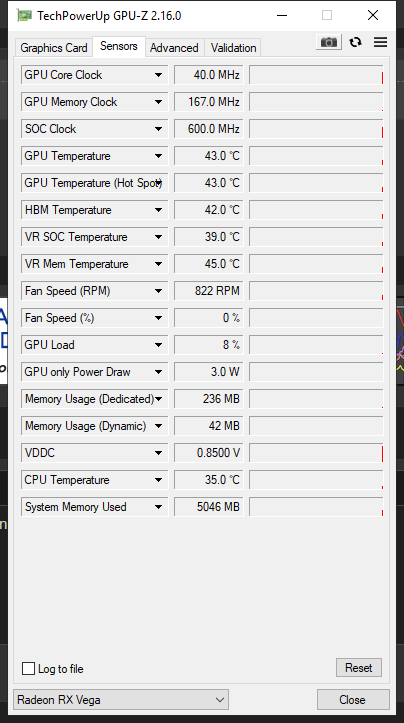 My gpu is 48C and fan is 0% according to phoenix miner program. (I have set target temp 50C). But I also have set minimum rpm. Is the fan completely shut off when my mining program shows that the fan is 0%? Or is it 0% compared to what minimum fan speed is. That it is actualle 500rpm (0%) and max is 2400rpm (100%) ? FlawleZ, GSDragoon, faridgv and 1 other person like this. Hi, Been using this tool for some time, on my Rx 480 I can force the voltage all the way up to 1.36v but always have the same problem that the card does not allow more then 150w, maybe we can get that funcion in the future to determine how much W we can allow the card to go. yours is a very good piece of software. It works much better than Wattman and anything else I've already tried to apply some undervolt and a custom fan curve. Anyway, my RX 480 loses the configuration anytime I restart the pc but more importantly when I wake up the computer from sleep mode. I know it's possible to write these values permanently in the card's bios, but I had problems setting the custom fan curve. Right now in the tool I disabled Zero-fan mode and adjusted the fan curve points according to my requirements. 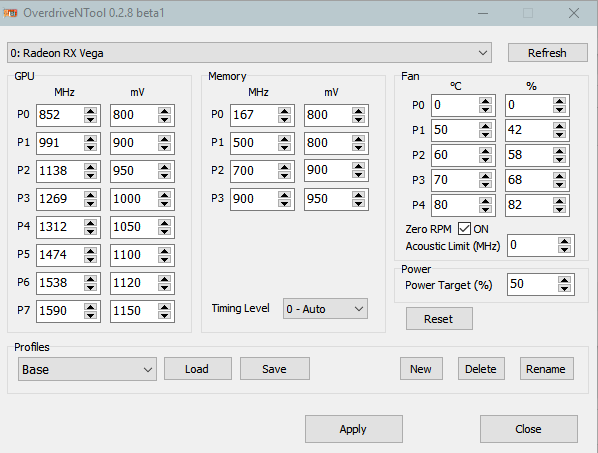 I've already tried to disable Zero-fan mode in bios, which works, but the custom fan curve doesn't. For that I know I have to select the "LUT" fan control mode, but when I change that value my pc crashes with a blue screen and I can't find a way to avoid it. Solved! It was Afterburner: just disable the last setting "Erase autosaved startup settings" and everything should work correctly. First off, thank you so much for creating this tede. It has been a life saver on my Vega 64. Secondly, do you have any plans to add support for Radeon VII? Sorry, I'm not planning to add support for Vega VII for now. 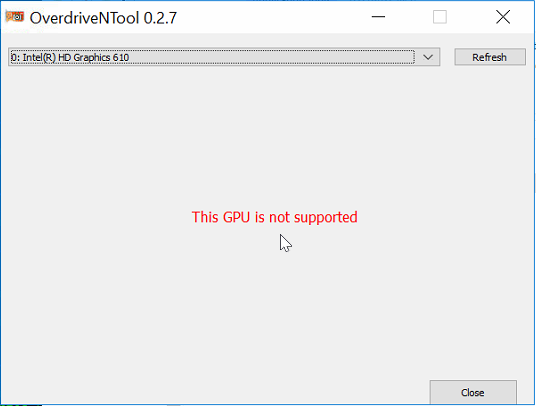 Mainly beacuse of lack of an updated ADL SDK from AMD, also another problem is that I'm not able to test Overdrive8 API on my GPU (not supported). Maybe by increasing Power Target? If 50% is not enough for you, than increase this limit in SoftPowerPlayTable editor. @tede thank you for your work! Can you describe the process of applying timings (levels) in more detail? I'm looking for a way to apply them without using Radeon Settings or OverdriveNTool.